Prominent & Leading Exporter from Ahmedabad, we offer digital yarn splice strength tester, multi strength tester and single yarn strength tester. Digital Yarn Splice Strength Tester is offered to clients and is used for measuring the strength of the yarn under various stages. These are offered by us are manufactured using quality material and in compliance with quality standards of the industry. We have provided durability, reliability and high performances and efficient solution for testing requirements through advanced and comprehensive functionality. 3 kind of unit displays: Gram, Newton, oz. Our organization deals in offering an extensive range of Multi Strength Tester, which can also be customized as per the specification give by clients. These are manufactured by using best grade raw materials and acknowledged for the durability, reliability and high quality features. Our tester range of micro controller based electro-mechanical testing machines suitable for carrying out a tensile test on a variety of materials such as yarns, fabrics, lea, papers, wires, etc. Micro controller based panel-incorporating state of art technology. Digital display of force, elongation & speed values on large backlit LCD display unit. Choice of multiple load cells selectable via keyboard. 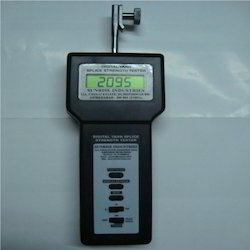 We are affianced in offering a wide array of Single Yarn Strength tester to the respected clients. Our product is widely used for testing the items like cotton yarn, wool yarn, chemical fibre yarn etc. It provides an inexpensive way of determining the tensile strength and elongation of yarn in single strands. We supply these components to our clients at competitive prices in the market.